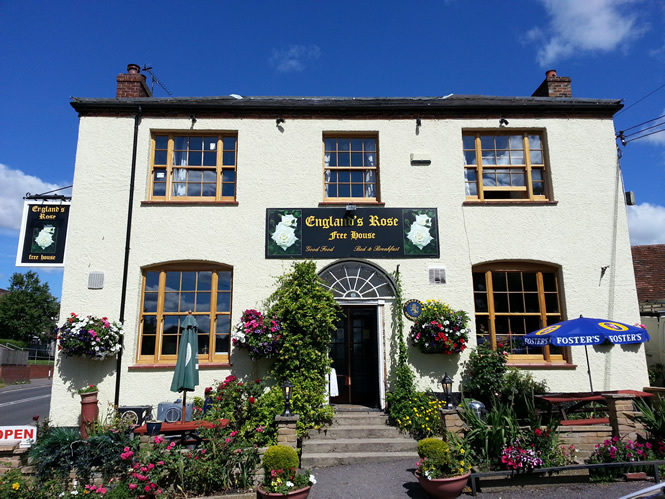 Situated in the village of Postcombe, Oxfordshire, at the foot of the Chilterns, Englands Rose Pub is set in beautiful Oxfordshire countryside. You can be assured of a warm welcome when you visit our lovely village pub. Our menu includes Full English Breakfast, Lunches, Dinners, Afternoon Teas or if you just want a latte or cappuccino then feel free to pop in. We serve food from 7.30am until 2.30pm and then from 4.30pm until 9pm, 7 days a week. The Englands Rose Pub has an ideal function room for meetings, wakes, parties or other occasions and is available to hire throughout the year. We can cater for a finger buffet or we can offer a personal carvery meal for up to 40 people. We have a large beer garden of almost two acres in size which is ideal for a lazy summer afternoon. The garden is equipped with a barbeque area, benches and is perfect for children of all ages, with an excellent children’s play area which includes a climbing frame with a slide and loads of space for children to run around. This is also ideal for camping and bird watching as the lovely Red Kites fly over frequently. If you are looking for Bed and Breakfast accommodation then we have three bedrooms of various sizes, all have en-suite, tea & coffee making facilities, trouser press and television. Contact us to check availability. We are in an ideal location for Thame, Oxfordshire, Oxford and London. There is a regular local coach service to London (Oxford Tube).